The sea off the coast of Genoa, Italy, glistened in the sun-bathed but crisp mid-October morning. I walked down the dock with the ancient city off to my starboard. At the quay to my port sat 60 feet of modern engineering: a flagship flying-bridge motoryacht from the French builder Prestige. 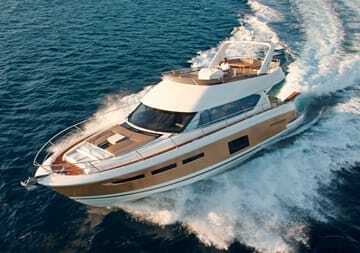 While this builder’s parent company Jeanneau has a history in Europe almost as rich as Genoa’s trofie al pesto, Prestige, a new brand, which started off as a model series for Jeanneau, is still expanding its presence in the west. 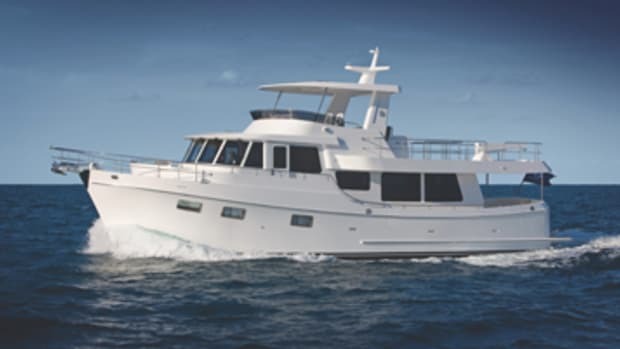 It believes the 60, which is the largest in a line of express and flying-bridge vessels starting at 38 feet, could be the boat that helps make it a household name stateside. The company also hopes this new yacht will lead to larger models—perhaps an 80-footer in the not-too-distant future? While it was nice to envision running the company’s first megayacht, I needed to evaluate this 60-footer’s potential for the American market. 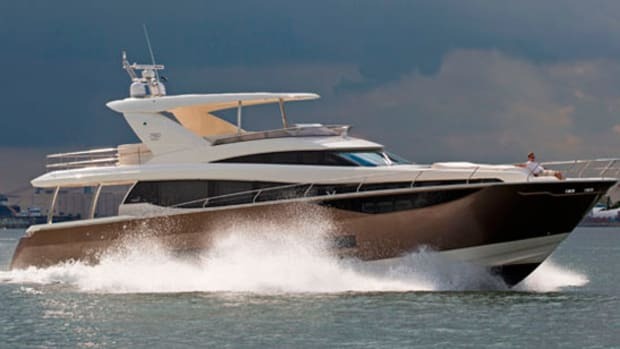 Her lines, which come courtesy of the design team of Vittorio and Camillo Garroni and Prestige’s staff, are a blend of modern and traditional motoryacht features. A contemporary one is the aggressively raked radar arch, which is home to the Raymarine radar and Volvo Penta Dynamic Positioning System (see “Noteworthy,” this story), but she also has more traditional and subtle shapes and curves like those found in her handrails and the slightly porpoise-looking profile. 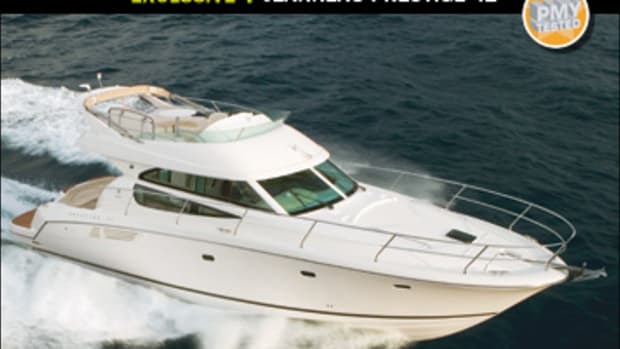 Her outward appearance, which on my boat was enhanced by an optional champagne-colored hull, would surely entice buyers to step off a boat-show dock and across her standard 16&apos;8"-wide swim platform for a close-up inspection. The teak on the platform, which can also be fitted with hydraulics for lowering a tender, was cleanly installed and made for a solid first impression. A few steps up, the 60’s cockpit has alfresco meals in mind, as it features a table and bench-style seating for four. Dining guests are protected by both the flying-bridge overhang and an optional and retractable bimini top, which is cleverly concealed in the overhang and is accessible by opening a small hatch. 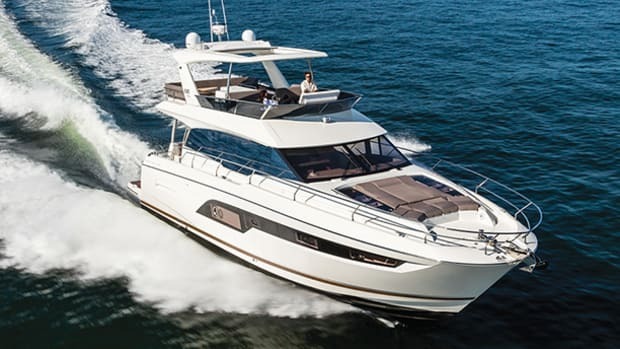 If the weather is beyond the shading or water-repelling capabilities of the bimini, the 60’s saloon, which sports 6&apos;10" headroom, also has a dining area amidships and to starboard. In addition, the saloon offers 360-degree views through tinted windows. Natural light floods the space. What will absolutely remain is the standard cherrywood-veneer woodwork. Its warm tones will appeal to most buyers, but for those who want to add some personalization, Prestige offers a dizzying array of fabric and leather options. While standardizing many of this boat’s features helps to optimize build time and keep the 60’s pricing competitive (U.S. pricing had not been set at presstime), have no fear, this builder also understands that owners also like to put their own stamp on a vessel. 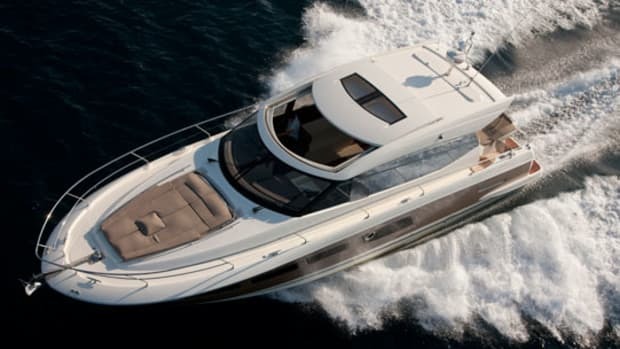 Another thing that won’t change is the twin 700-bhp Volvo Penta IPS 900 diesel propulsion. 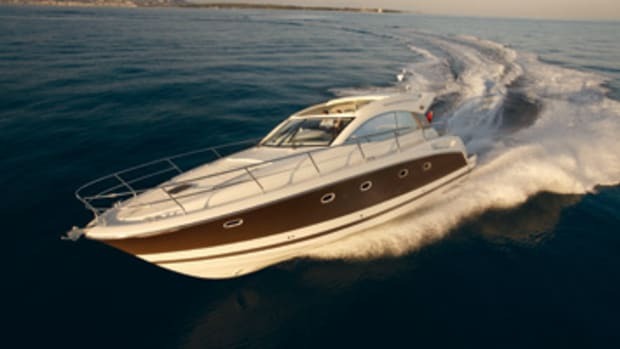 These engines were chosen specifically for this vessel, which features a deep-V hull design from naval architect Michael Peters, who has designed for Cabo, Sea Ray, Chris-Craft, Cigarette, etc. The engines sit in a space with average headroom of about 6&apos;6", which should make the area quite comfortable to work in, especially as the engines are accessed via a centerline cockpit hatch that bathes the area in light. One picky point regarding the motors: Volvo Penta doesn’t offer these powerplants with dipsticks and oil fills on the inboard sides of both motors. So to check and fill oil on the port engine, you have to walk forward of it, and just before the centerline (and optional) 17.5-kW Onan e-QD genset, you must slide in front of the engine and climb around the outboard side. The motors, which are fitted with jackshafts enabling the builder to keep the engines’ weight forward (between the cockpit and saloon) thereby enhancing balance, sit on beefy-looking stringers that measured 16"Hx51⁄2"W.
That said, you can expect the American version of the 60 to be just a bit faster. Why? Starting with Hull No. 2, the 60’s flying-bridge superstructure will not be conventional hand-laid fiberglass but rather vacuum-infused, a process Prestige’s parent Jeanneau has employed for some time on its sailboats. It typically uses less resin and fiberglass and so produces a lighter product that should lower the boat’s center of gravity, providing an even more stable ride as well as enhanced handling. It should also increase her speed. This 60’s numbers were right in line with the builder’s predictions. 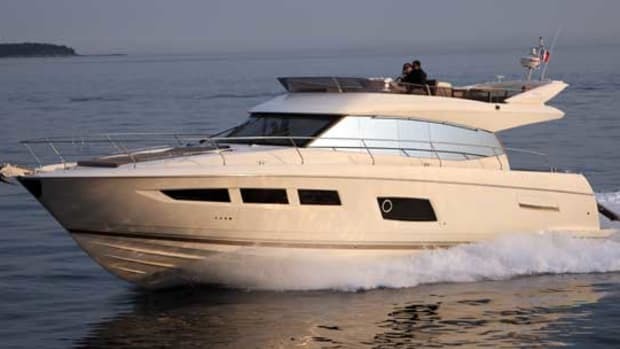 Cragnotti says that Prestige wanted a yacht that was fast, yet comfortable to operate. This thinking was also applied to programming of the IPS software that sets the boat’s turning radius. While pod drives let builders create a vessel that can turn on a dime at high speed, Prestige opted for a wider turn, which I estimated at three boat lengths at cruise speed. The steering was effortless as the wheel spun without resistance. Any turn resulted in a real-time reaction from the drives, and when it came time for close-quarter maneuvering, I simply put the single-lever electronic controls in neutral, engaged the optional joystick with the push of a button, and spun her on her axis, sliding all 60 feet sideways with one finger. This 60-footer that could easily be handled by a couple. But being Hull No.1, there are always a few fine-tuning issues. For instance, during low-speed running the doors to the forepeak VIP and under the flying-bridge grill rattled. The master stateroom, which is full-beam and accessed via winding steps from the saloon, doesn’t have a door, which it needs for privacy. The master’s starboard hanging-locker door opens into the Sony LCD TV on the bulkhead; I’d suggest adding a doorstop, moving the TV somewhere else, or dropping it down from the overhead like the saloon’s TV. If all else fails, I’d use a TV with a smaller screen. That said the parquet look of the hanging locker’s doors is eye-catching, and the master is bathed in as much light as the saloon, thanks to two 59-inch-wide by 18-inch-high windows flanking the queen-size berth. There’s also plenty of room for guests in two more staterooms, the aforementioned queen-berth-equipped VIP and a guest stateroom starboard just aft of the VIP that sports side-by-side berths. Each stateroom has an en suite head, too. All in all, I’d say Prestige hit the mark when it comes to design and performance. Does that mean she’s ready for primetime? I think so. Her standards list is long and yet there’s also room for personalization. And she should be a good dollar-value, too. Cragnotti assured me that the boat’s cost will be very competitive for the American market because of its parent company’s ability to buy materials in large volume. 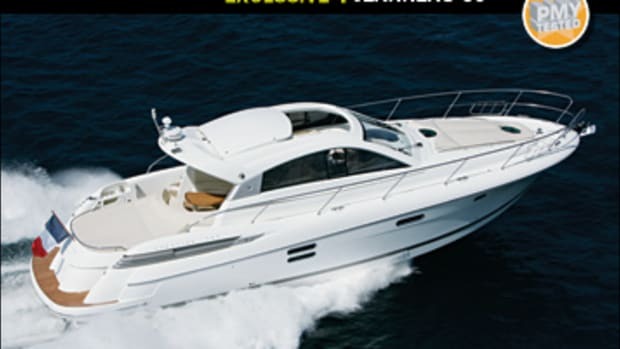 Hey, this boat might be so attractively priced that you have enough left over to opt for European delivery. Pick her up in France and run her to Genoa to try the city’s signature pesto. Really, it’s that good. To keep your boat jockeying to a minimum, Volvo Penta has devised a dynamic-positioning system that with the touch of a button on the IPS joystick, can keep your boat right where she sits. 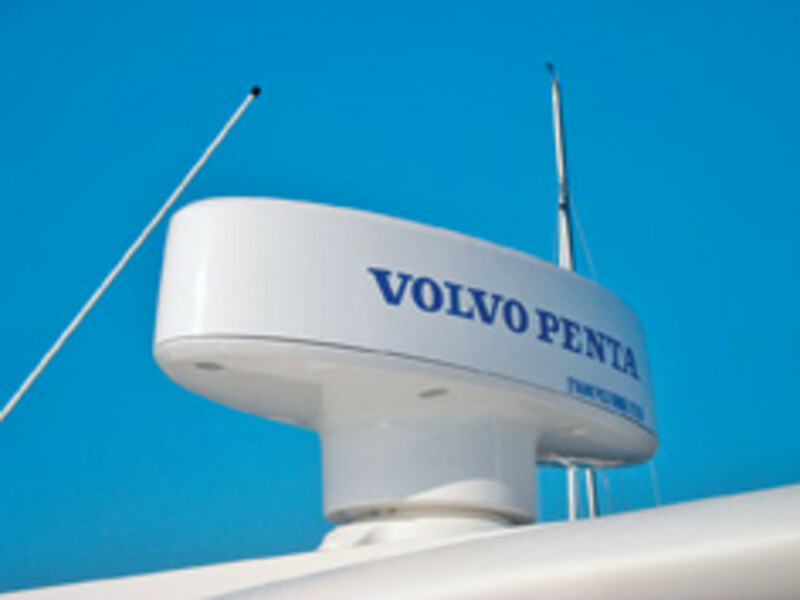 According to Volvo Penta, the system uses a specialized antenna (right) with not one, but two GPS receivers that provide extremely precise information on the boat’s location. This data allows software to engage the engines and instantly adjust their rpm as well as the pod-drives’ position to keep the boat where you want her. An optional Volvo Penta seven-inch LCD display enables the helmsman to monitor the system at all times. — P.S. 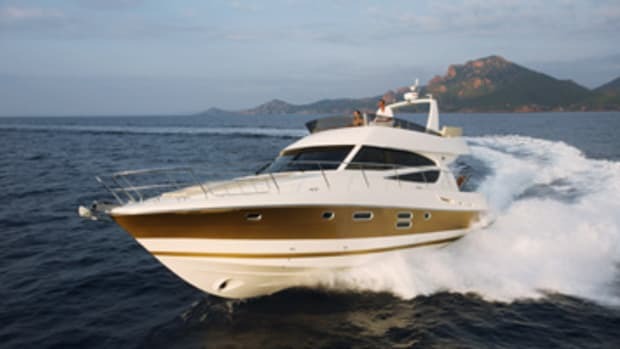 This article originally appeared in the December 2009 issue of Power & Motoryacht magazine.